First dilute date molasses in water and put on medium heat. Then let come to boil. And then add the grated coconut and mix on slow fire till the mix becomes sticky. If you want approx 6-7 minutes. 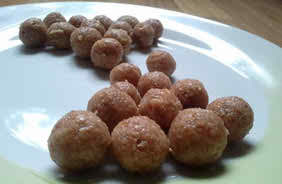 Now try to make small round balls with the mix. If the balls from well then the mix is ready. Then remove from heat and let cool down. Please remember this coconut Nadu hardens when cooled down. Finally serve this coconut Nadu any decorated plate or bowl.